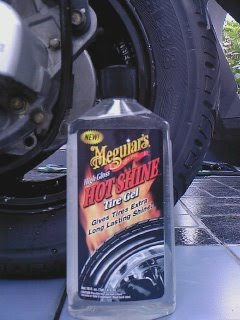 Sunday, May 3, 2009, I want to try out the result of Meguiar’s® Hot Shine™ High Gloss Tire Gel on my tire. I wash my scooter and finish it with the Ultimate Quik Detailer. After that, I shake the Hot Shine bottle and remove the inner seal. 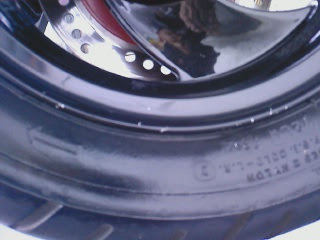 I pour the gel onto the sponge and wipe it to the side wall tire surface carefully. 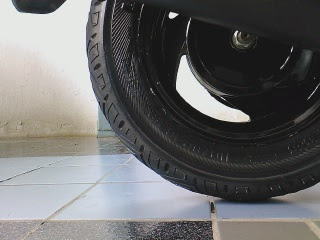 "Be sure not to apply on the tire surface that contact with the road, because it will cause slippery on your tire"
As you can see, the result is very dark black and deep gloss, I like it so much. Meguiars recommend to apply second layer for best result, and the second layer must be apply 10 minutes after the first layer. 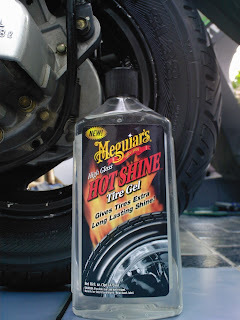 Lets wait how long this Hot Shine can protect my tire from UV dan rain badly, is it 1 week? Or may be 2 week? Or may be more or less than that. 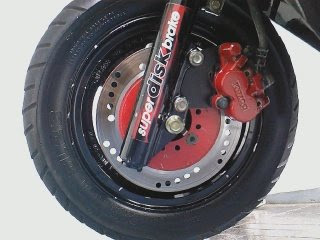 I don't know for sure, but I hope it will last longer than the tire protectant that I used previously. And hope too that dirt and mud doesn't adhere strongly to the tire surface not like my previous protectant, so I can easily clean it.